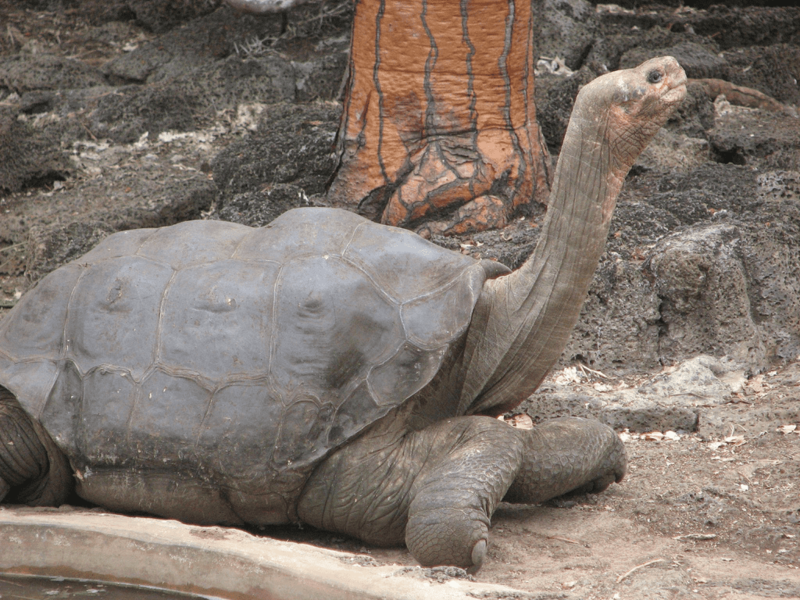 Scientists have sequenced the genomes of ‘Lonesome George’ — the last member of the now extinct Pinta Island tortoises from the Galapagos Islands — and another giant turtle species. The analysis revealed that the venerable tortoises are equipped with genes that may explain the exceptionally large sizes and long lives of these creatures. The last (known) Pinta tortoise, Lonesome George. Credit: Mike Weston. Lonesome George, also known as the “loneliest animal on the planet,” was the only documented Pinta Island tortoise (Chelonoidis nigra abigdoni). He had been living in captivity at the Charles Darwin Research Station on the Galapagos Islands since 1972. He was about 100 years old when he died on June 24, 2012. Galapagos tortoises are the only tortoises with distinct shell shapes. For instance, Lonesome George’s shell was a “saddleback,” meaning it is slightly dipped near the front, making it look like a saddle. The shell’s shape allowed George to raise his neck higher than other tortoises, thus reaching the leaves of tall bushes to feed. A combination of human hunting and invasive species (mostly goats), flung Lonesome George and its species into extinction. In the space of a few hundred years, the tortoise population in Galapagos collapsed from hundreds of thousands, maybe millions, to just a few thousand individuals. George’s cousins aren’t fairing too well either, with all eight Galapagos tortoise species being classified as vulnerable or endangered. One of the defining features of giant tortoises is their long lifespan. Researchers at Yale University and Universidad de Oviedo, Spain, want to see if genes had anything to do it. So the research team sequenced the genome of Lonesome George for the very first time, along with that of the Aldabra giant tortoise (Aldabrachelys gigantea), which is the Indian Ocean’s only living species of giant tortoise. “Lonesome George is still teaching us lessons,” said Adalgisa “Gisella” Caccone, senior researcher in Yale’s Department of Ecology and Evolutionary Biology and co-senior author of the study published in Nature Ecology & Evolution. The researchers uncovered gene families associated with metabolism regulation and immune response, which may explain the generous size and long lifespans of these species. Although long-lived organisms are theoretically at a higher risk of developing cancer, tumors are nevertheless very rare among turtles. The researchers have found that tumor suppressors are expanded in the tortoises’ genomes compared to other vertebrates. The analysis also found specific alterations in two genes whose overexpression is known to contribute to cancer, and which may be part of a giant-tortoise-specific cancer mechanism. “We had previously described nine hallmarks of aging, and after studying 500 genes on the basis of this classification, we found interesting variants potentially affecting six of those hallmarks in giant tortoises, opening new lines for aging research,” Carlos Lopez-Otin at the University of Oviedo in Spain said in a statement. By gaining a better understanding of the biology of giant tortoises, the researchers hope to contribute to ongoing efforts to conserve the dwindling lineages. Lonesome George may have died — and along with him, an entire species — but his story is still alive, written in a genome whose secrets we are just beginning to explore.